Regal, capable, and classic, Eleanor makes a great name for a daughter. Thanks to Nessa and JNE for suggesting our Baby Name of the Day. The influential Eleanor of Aquitaine often gets credit as the first bearer of the name, only that’s not so. Probably born around 1122, her mother answered to Aénor. Legend tells that Aenor named her daughter Aliénor from the Latin phrase alia Aenor – the other Aenor. Whispered into French and English, it took its current form. 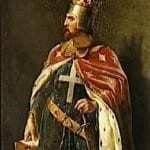 William the Conqueror’s aunt answered to the name Eleanor a solid century before these events. She may not be the first, but her legacy makes her unforgettable. The well-born heiress boasted both good looks and book smarts. Educated in both traditionally feminine and masculine pursuits, she inherited her father’s holdings as a teenager, becoming the most eligible brides in all of Europe. 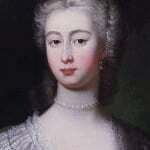 No wonder, then, that the accomplished aristocrat became Queen of France and later Queen of England. In Paris, they Latinized her name as Helienordis. Powerful, intelligent, and capable, the Duchess and Queen served as patron to writers, schemed for her children’s political advancement, led an unsuccessful crusade, and determined her own fate to a degree unthinkable for most women in her era. Plenty of other women wore the name, including many a queen and aristocrat. By the 1200s, the name entered regular and steady use. Jane Austen’s Elinor Dashwood, from 1811’s Sense and Sensibility. The Beatles’ song “Eleanor Rigby.” While reports vary, it is believed that the name came from a gravestone in a cemetery near Paul McCartney’s childhood home. The original Miss Rigby might have been a scullery maid. 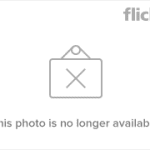 One of the Chipettes – Alvin & company’s female counterparts – is known by the name. Karl Marx gave the name to his youngest. Dancer Eleanor Powell tapped her way through 1930s Hollywood hits like Born to Dance. JRR Tolkein created an Elvish version of the name – Elanor. E! original series The Royals gives the name to a partying princess. But perhaps the most enduring association in the US is former First Lady, Eleanor Roosevelt. Born into a privileged family and highly educated, Miss Roosevelt – she and her future husband were fifth cousins – made waves as an activist and political campaigner in an era when women did not engage in public life. She proved an unconventional First Lady, too, publishing a newspaper column, holding press conferences, and speaking widely. In 1940, Mrs. Roosevelt became the first First Lady to speak at a national party convention, and she served as a powerful advocate for the early civil rights movement. It seems impossible to list all of the ways she changed the role. Controversial at the time, she continued in public life, becoming the first chairperson of the United Nations Commission on Human Rights. Today she is considered among the most widely admired women in American history. With admirable namesakes and nicknames galore, no surprise that Eleanor counts as a classic today. The the name is enjoying new heights of popularity, too. It re-entered the US Top 100 in 2014, for the first time since the 1940s. Today it makes a rock solid choice for a daughter. Originally published on January 18, 2009, this post was revised and reposted on November 14, 2016. My name is Eleanor. I used to really hate my name, but when I started looking up meanings it actually started to grow on me. Now I’m proud to carry it. I get so many variations of my name, the most common being Nelly, then Nell, one person calls me Ellie, and one calls me “Spaganella”. I really don’t know where that came from! I love that I share a name with Eleanor Roosevelt, and aspire to be like her one day. My husband loves Eleanora. I’m happy I married a man with good taste in names but I just don’t like it. I prefer Annora to Eleanor(a). A major reason for that being is it has no known meaning. My name is Eleanor. I was named after many generations of Eleanors in the family and I have loved my name from the day I could say it. I hated beig called “Nellie” as a child so as soon as I could “put my foot down”, I have used my proper name….Eleanor. I have a young cousin who also has Eleanor for her name. To possess this name is a blessing and I thank God that I have it. I wonder if the name Leonor has any relation to Eleanor. My aunt is named Leonor, those close to her call her Leo. I don’t know the origin, but we are hispanic so it could be that. We call her Tia Nor, tia meaning aunt in spanish. Nessa, what a great family tree! I’d use Eleanor in a heartbeat if I were you. JNE, that’s a funny thing about family names. If you use them, there’s pressure to keep going. If you don’t, well … it’s kind of like the Jolie-Pitt kids. How come #5 and #6 suddenly get *family* names? It feels unbalanced. Paige, I think you’re right about Nellie always being the mean girl. Charlotte, too bad about your husband’s veto. It often feels like the baby naming dynamic is that mothers generate ideas and fathers shoot them down. I’m jealous of every woman who reports her partner is interested in choosing names. 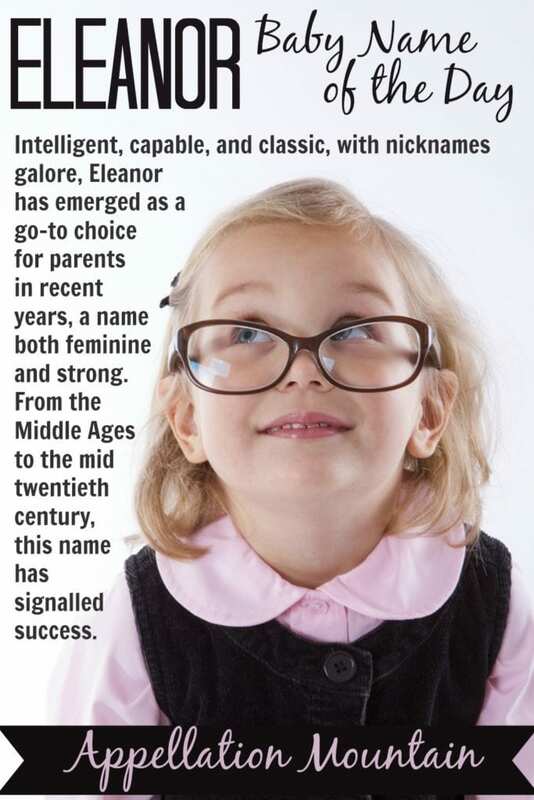 Yes, Eleanor’s a wonderful name. I’d use it or Eleanora and if I used a nickname it would be Nora. Just shows how tastes change – 20 years ago I wouldn’t have even thought of it. I have an aunt by this name but her family pronounced it ELL-a-ner. Far more elegant when the last syllable is pronounced nor. Eleanor was my number one name choice for my soon-to-arrive baby girl, but my husband — foolishly in my opinion — vetoed the suggestion. I’m still hoping that I’ll have a second opportunity to suggest the name and that it will then have a better reception. Eleanor has made my top 10 recently (well, to be more accurate, probably my top two), so I’m excited to see her as Name of the Day. I was looking for good Katherine substitutes — it’s a name I’ve loved forever, but I fear it’s too common, and my husband doesn’t like it — and Eleanor is the name that comes closest to Katherine’s “feel.” My husband likes Eleanor, and he thinks the nickname Nora is sweet. If I had twin daughters tomorrow, they’d be Clara and Eleanor. Nessa — you have GOT to use Eleanora, considering the family connection. Good luck talking your husband into this one. I’m behind you 100%! It’s funny, Verity, this is one that seems to be high up on a lot of your readers’ lists. I think Nora is in photoquilty’s top two as well. Wouldn’t it be funny if three or four of us ended up having little Noras/Eleanors someday? Oh man, this is so exciting! I had NO idea that Eleanor of Aquitaine was the first bearer of the name, she and Eleanor of Provence are the reason I started considering this name in the first place! I’m directly descenced from both of them, so I thought it would be awesome to name a girl after two incredible women that she’s actually got ties to. Before you posted this, my hubby said the same thing everyone else’s did “no, I don’t like it” (why do men dislike Eleanor so?) But now he seems a lot more interested… we’ll see 🙂 I think I prefer Eleanora, it’s just a bit more girly, which I like. She would certainly be called Nora over any of the other nicknames. I’ve never been a fan of the name though. The closest form I do like is Lenore, probably because “The Raven” is my favorite poem [so much that I named my first dog Poe]. Oops, sorry for the double post — I didn’t think it posted then obviously tried to recreate what I’d written, lol. I like Eleanor; its number 7 on my short list. It’s very regal sounding, and like you all have said, feminine, yet not frilly. It does despair me to see her so high on the charts–and likely to rise–and although I’d never use it if it ever were to make its way into the top 100, I’d love to meet more litle Eleanors. No Ellies or Ellas; that’s been done to death, or at least it will be before long. Nora is probably the one I’d use, but I like Nell/Nellie too. As for the alternative spellings, I like Elinor, but not Elanor, despite being a Tolkein fan. It ust looks all wrong to me. I wouldn’t use Elinor; it doesn’t give off as much of a regal impression as Eleanor does, but I’d love to see it on someone else’s kid. I love Eleanor’s time honoured feel and her look, although I actually prefer the cleaner looking Elinor, the ‘nor’ sound is so regal and elegant isn’t it? I’m not keen on the inevitable nickname Ellie though, Ellie’s abound in England – sometimes they are Eleanor’s but more often than not, they’re just Ellie’s. The popularity isn’t really the issue though, it’s more that for me, Ellie has become synonymous with some of the spoilt/naughty little girl’s I’ve known with the name. Although this issue taints Eleanor/Elinor, I think it could be avoided. The nicknames Nora and Nell are much more sassy, engaging and unusual and lend a whole new dimension to the name. I love Eleanor and Tolkien’s Elanor. The former is so pretty and has so much dignity. I like the nns Nora and Nell (but not Nellie- it will always be Nellie Oleson!). The latter is beautiful (in LOTR, it is a flower, I believe), but my fear is that my prospective child will spend her entire life correcting people’s spelling of her name. Both are wholeheartedly endorsed by me! I prefer literary Elinor & Elanor, I knew a nasty E;eanor as a kid & I’m off that spelling forever. I still occasionally have nightmares with her in them. I do admire Eleanor Roosevelt and Eleanor Rigby is one of three Beatles tunes I like. Eleanor gets a :thumbsup: from me! JNE, too bad your Hubby nixed Eleanor, she’d make the perfect sister for Imogen! I absolutely adore Eleanor! It’s smart, sassy, feminine, but not frilly – an all-around fantastic name… My husband does not like it. Period. No discussion. It makes me sad. My only reservation about using the name, other than the staunch opposition from the other half, is that it was my grandmother’s name. She is gone now, but while I was pregnant with Imogen, she asked me to name her Eleanor. I told her I would not use a family name… and I generally wouldn’t… except that I love the name! My grandmother no longer being around makes using the name a little less awkward, although I’m still not a fan of naming after… but with such a great name, I could make an exception! And Imogen and Eleanor make a good sibset, I believe… Getting the hubby to agree would be the major hurdle… For me, this name is probably my top girl name currently. […] – Clara and Elinor could be sisters. […] is falling, while the other names might be closer to making a comeback. […] Emma, she’s perfectly reasonable for much of the Middle Ages. […] of course, Eleni has impeccably classic roots – she’s derived from Helen. […] derived from ali – a Germanic element meaning foreign or other. […] the masculine choices for future sons, and look elsewhere for a daughter’s name. […] Robert III of Dreux in the 1100s. […] also brings to mind Nora and Eleanor. […] #235 in 2009, she’s about as common as Kendra, Sabrina, or Eleanor. 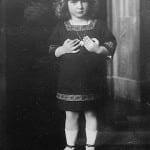 […] Roosevelt was the little sister of President Theodore Roosevelt, and aunt to First Lady Eleanor Roosevelt. […] But it is Elsinore’s sound that places her in their company.